Butterflies in the stomach. Nail-biting terror. Gut wrenching anxiety that can often lead to head-in-the-sand, hide-under-the-covers panic attacks. This is what many of us face when confronting the need to organize. Actually, though, there is hope for our kind..
One sidebar of setting up my new website was facing the need to reorganize my photo library and the getting the thrill of rediscovering old favorites, some almost totally forgotten. Given years of work as a professional photographer with thousands upon thousands of images to manage, it’s not that I wasn’t organized. I couldn’t afford to not know where image files were. Unfortunately, with software, imaging capabilities and output requirements constantly in flux, my system had been developed on the fly. On the good side, as far as assignment work was concerned, a management system that I adapted from the method of Scott Elias back in my ‘80s music days, held up amazingly well. In mere moments, I can track down the location of a client’s image from a decade ago. Locating my own work? That’s been another story. The problem was that I’ve always organized work in a calendar year system. Along with my client projects, each year contained of set of my personal images. Often captured on the fly, however, some really cool images were easily buried and forgotten. I did have a separate Lightroom library for my “portfolio” work but my entries were haphazard. The collection didn’t necessarily coincide with how I organized galleries on my old site. This time around, when I couldn’t find images I knew I’d like to not only show but also SELL online and which, shall we say, were not easy to locate, I had no choice but to knuckle down and throw myself down into another rabbit hole. It was frustrating, of course, as it could only delay progress on the site but I knew it would be worth it. After all, when a purchase order comes in, the inventory had better be easy to locate! Lo and behold, I rediscovered images from quite awhile ago, before I officially set out to be a professional photographer that brought on a rush of sensation. One particular set was from my year as an expat living in Hong Kong in 1996/7 -- the period known as the Handover, when rule reverted from the British Empire back to China. It was an exciting time to be there. Then, I wasn’t so interested in ‘documentation’ (maybe in retrospect I wish I had been) as much as the art of photography. As such, while I did some color work, my preference was infra-red 35mm film. 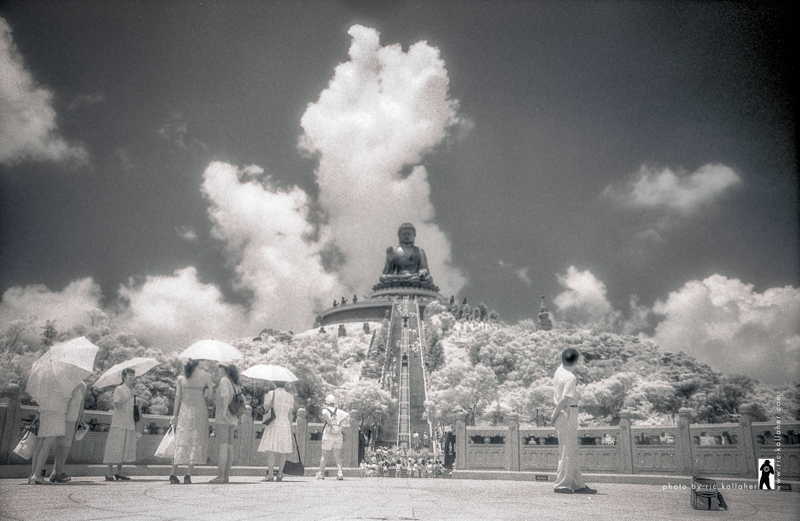 Infra-red is a challenging and difficult format & process but, to me, it was worth it. The properties of that type of film produced photos that evoked an almost dream-like state that appealed to me quite a bit. Finding myself living at that particular time in such a foreign place often seemed like a dream and so it all fit together nicely. Seeing again, one of my favorite photos from that time, an image attempted almost as a lark since in the growing darkness that was present I never really expected any decent results to emerge, was particularly satisfying. I went so far as to turn out a print to use on a box I made to store some inks and colored pencils. So, if you need some exciting thrills in your life, try some organizing. You might be surprised by what you uncover.